HBO’s half-hour comedy Ballers returns on July 23, 2017 at 10pm ET/PT starring Dwayne Johnson as a former NFL player who’s transitioned into the world of financial management. Ballers was created by Stephen Levinson and is executive produced by Johnson, Levinson, Mark Wahlberg, Dany Garcia, Peter Berg, Evan Reilly, Rob Weiss, Julian Farino, Denis Biggs, and Karyn McCarthy. 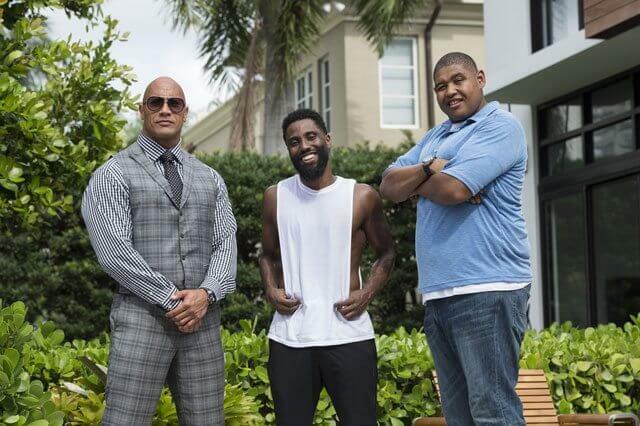 In addition to Dwayne Johnson, the season three Ballers cast includes Rob Corddry, John David Washington, Omar Benson Miller, Donovan Carter, Troy Garity, London Brown, Jazmyn Simon and Dulé Hill. Guest stars include Richard Schiff, Steve Guttenberg, Steven Weber, Emayatzy Corinealdi and Serinda Swan. The Season 3 Plot: After baring his soul at the rookie symposium and undergoing hip surgery, Spencer Strasmore returns with a new outlook and fresh goals, hoping to forge bonds with new players across the country while improving his relationships with existing clients. With league certification in hand, Joe Krutel and Spencer go after a jackpot deal. Ricky Jerret’s newfound discoveries affect his personal and professional life; Vernon Littlefield and Reggie accept a risky endorsement deal; ex-player Charles Greane learns that working in the front office is as rough as playing on the gridiron; and Jason Antolotti continues to orchestrate deals to satisfy both players’ bank accounts and their oversized egos. In an ever-changing business where the shelf life for stardom and multi-million-dollar contracts are short, Spencer is intent on proving that the key to successful sports management isn’t just about making money and having fun – it’s about delivering on the promises you make. Looking at the whirlwind lifestyles and real-life problems of former and current football players, Ballers stars Dwayne Johnson as ex-superstar Spencer Strasmore, who has reinvented himself as a financial manager for today’s players in sun-soaked Miami.